We finally got Compass Rose back together and sailed for Portsmouth, Dominica, some twenty miles to the south. We had a good wind angle and relatively mild seas. The trip went well and we arrived in Dominica without incident – quite a relief after our sail to Les Saintes. One of the River Guides met us as we approached the bay and led us to a nice sandy spot to drop the anchor. We have always liked Dominica, but we have not spent much time there since our first visit in 2010. We arranged for a tour of the northern part of the island. Our driver, Winston, was pretty knowledgeable about the island’s history. We stopped just outside of Portsmouth to visit an agricultural exhibition where we saw a lot of interesting plants, fruits and vegetables. Some other notable sites he took us to were the Emerald Pool, and the Kalinago reservation. The Kalinago, better known as the Caribs, have a reservation on Dominica’s east coast. Part of it is set up as historical site where you can see aspects of traditional Kalinago life. We also saw some beautiful views of Dominica. And not to be forgotten, there was the restaurant where we had lunch while listening to Frank Sinatra’s greatest hits. The next day we dinghied to Cabrits Park and walked around Fort Shirley. The lower part of the fort is nicely restored and there are many ruins of old buildings and gun emplacements in the hills. We also saw some crabs and a snake as we walked through the woods. We looked ahead to the weather and decided to do the eighteen mile run to Roseau, the biggest city in Dominica and the jumping off point for the crossing to Martinique. It was an easy trip. We sailed, motored, and motorsailed as the wind dictated. We tried to raise Sea Cat on the radio so we could take one of his moorings, but he never answered. We picked up a mooring and figured that the owner would eventually stop by to collect the fee. No one ever did, but the area is pretty rolly so we rocked back and forth most of the night. The next morning we motored out of Roseau. The wind started to fill in wrapping around the island and coming north. We worked out way out to get a sailing angle and found plenty of breeze. We found ourselves riding a south flowing current and picking up at least an extra knot over the bottom. The current ran headlong into the waves that were building on the shallows at the south end of the island, so the seas got lumpy and confused. Compass Rose crashed along under reefed main at more than eight knots over ground. The seas settled a little as we got away from land and the wind settled in to a good angle. Just when it looked like we would have a fast, albeit wet trip, we heard a familiar noise and watched the bow sprit pop up and the jib slacken. We had been through this drill before. We dropped sails, stabilized the rig with spare halyards, and started motoring back against the strong current and through the confused waves. I looked over the bow and saw that the bracket that holds the lower end of the bobstay had failed. All spring Jackie and I had talked about spending more time in Dominica this year, but this wasn’t what we had in mind. Pancho, a boatboy greeted us as we arrived back in Roseau and took us to one of his moorings near the Anchorage Hotel. We told him about the problem and he recommended a welder and could arrange for transportation to the welding shop. Dave and I got to work getting the bracket off. I replaced the bolts that hold the bracket on while we were in the boatyard so I knew the process. First we had to get all the chain out of the anchor locker so we could get to the bolts. Dave laid down in the vee berth and got a wrench on the nuts while I sat in the dinghy holding onto the boat in the swell with one hand while unscrewing the bolt with the other. The lower bolt hole is just a couple inches above the waterline, so I had to quickly put some caulk in the hole and shove the bolt back in to keep the water out. We contact Pancho and talk to him about getting a ride to the welding shop. The price is outrageous. The he suggests we take a half day tour of the southern part of the island that includes dropping the part off at the welding shop and picking it up at the end of the tour. The price is reasonable for a half day tour and he throws in the mooring rental for free. We go for it. Pancho picks us up early the next morning and takes us to shore where we meet Kelvin (sp?) our driver. He takes us through town to the weld shop where I discuss the job with the welder. He doesn’t have stock thick enough to replicate the part, but he will weld it back together and add reinforcements. We agree to a price – not cheap, but we need the part and it has to be strong. We hop in the van and head off into the hills of southern Dominica. Our first stop is Titou Gorge. There were two waterfalls separated by a very narrow gorge. A small dam was constructed at the top of the second falls and the water diverted through a wooden pipeline – think of a very long barrel – to a hydropower plant. The pool created backs up through the gorge to the base of the upper waterfall. We swam in the water impoundment – it’s always a novelty for us to swim in fresh water. But the coolest part was to swim into the gorge. It is very narrow and has high walls so it feels like a cave. 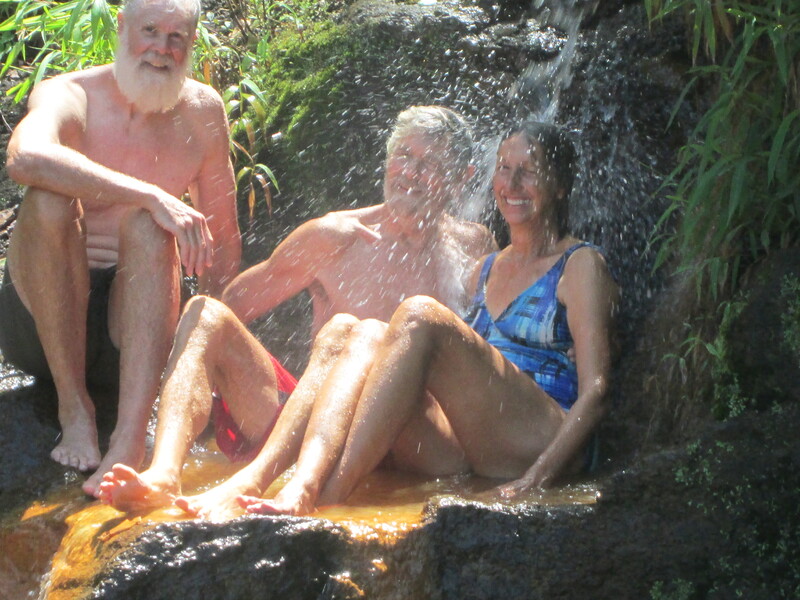 We ended the swim by sitting under a small waterfall that comes from a hot spring. Our next stop was Trafalgar Falls. This is actually two waterfalls next to each other, and despite their proximity, they have separate water sources. The hike down to the falls was easy and quite nice and the view of the falls was stunning. From there we went back to the welding shop to pick up the part. The welder had found a discarded piece of metal that was the right size, cut off the broken piece and welded in the new piece. It was a much better fix and I was much happier with the solution despite the higher price tag. We head back to the boat stopping at the fish market for some fresh tuna and mahi mahi, and then dropping Jackie off at the vegetable market so she could shop and then take a bus back to the boat. Dave and I put the boat back together. It’s a lot of fun hanging onto a bouncing dinghy while trying to tighten bolts and caulk the fitting. The wrench and caulking gun spend more time underwater than above, but we managed. The caulking looked perfect when we left the boat yard – now it looks like someone closed their eyes and put it on with a spatula. Little Rosie is once more whole and ready. Once again we set out for St. Pierre, Martinique, some thirty five miles away. The wind and waves are a bit milder, although it’s still windy and bumpy. After two rigging failures so recently, I don’t think any of us really breathe easily until we drop anchor. St. Pierre is a little town along the edge of the sea. In the early 1900s it was considered the “Paris of the Caribbean”. Then a volcano wiped out the town killing all but two people. Some buildings use walls that survived the volcano, so there is a mix of building style in some spots. We arrived too late to check in, but figured we could do rest and do it the next day. The next day is my birthday. It’s also Emancipation Day and there is a small carnival on the waterfront. We dinghied in only to find that no one is allowed to tie up to the town dock or land a dinghy on the beach within 300 meters of the dock. Eventually some other cruisers land their dinghies on the beach near us and the land owners look OK with it, so we do the same. We visit the carnival, but it is small and few people are there in the heat of mid-afternoon. We went back to the boat and spot some fishermen landing their boat by the beach. They set up a portable fish cleaning table and proceed to unload a yellow fin tuna that is almost as big as the boat. The boat in the picture is just the tender they use to get to their mooring, but the fishing boat wasn’t all that much bigger than the fish. This was one big tuna! That evening the activity in town began to heat up. We were already tucked in on the boat, so we stayed put, but we had a ringside seat for the great fireworks display on the waterfront. I’ve been trying to figure out how to deal with this topic, but I finally decided to cover it about the time we became aware of it. We heard that a boat was lost in the Atlantic. Cheeki Rafiki, a Beneteau 40.7 that competed in Antigua Sailing Week this year and won their class, was lost with all hands. She was returning to the UK and the crew called in that she was taking on water. Evidently she lost her keel and capsized. The US Navy reports that there is no sign of life on board and that the life raft was not deployed. It is now pretty certain that the four crew, Paul Gosling, James Male, Steve Warren, and Andrew Bridge, could not have survived this long in the sea. While we did not know the crew, we competed in the same regatta with them. In light of the issues we have had recently this strikes close to home. Things don’t always go as planned. The next day we ran down the coast to Grand Anse d’Arlet, another little vacation town. We would be in the lee of the island and the wind and waves should be relatively mellow. We expected a little jump in the wind as we passed the mouth of the bay at Fort De France. We left St. Pierre, hoisted sail, and started motorsailing and then sailing down the coast. The wind blew up into the high teens and twenties and stayed there all the way to Grand Anse d’Arlet. It was not the semi-lazy trip we expected. We motored into the bay and found that the planned moorings were now a fact. We had always anchored towards the south side of the bay near the town dock, but the only moorings available were on the north side of the bay. It turned out this was the rolly part. We went into town and walked around and eventually had dinner in a nice little resort/restaurant on the beach. The next morning Jackie took the dinghy and scouted the southern moorings, but none were available. We did see a number of boats anchored inside the edge and just outside the mooring field. We dropped our mooring and anchored just outside the mooring field near the middle of the bay. It was much calmer there. We went snorkeling that afternoon on the south side of the bay. It was a pleasant surprise. There was a lot of live coral and quite a variety of fish. I was sorry I didn’t take the camera. The weather looked good the next day and we made the twenty seven mile passage to St Lucia. Martinique is the eastern-most of the islands we frequent, so you would think we would get a break on wind direction when sailing south to St. Lucia. This is not the case in that we are going from the wide part of Martinique to the narrow part of St. Lucia and have to make easting the whole way. The trip was a little less windy and rough than a lot have been this year, but the wind direction and westward setting current prevented us from sailing the rhumbline during the first part of the trip. Luckily we got a little lift from the wind and the current moderated some as we neared St. Lucia. We made landfall just south of the anchorage and tacked into the Rodney Bay. We tried to anchor south of the channel off Reduit Beach, but found poor holding and our chain went under a couple large rocks. We moved north of the channel off Gros Islet and sunk the anchor in nicely. We got ourselves checked in and they told us we didn’t have to do anything special to get Dave off our crew list. It has been great having Dave on board. He is an easy guest and a great help when sailing – especially when things go wrong. Which brings us to the end of this phase of our cruise. Dave was able to arrange a flight out of the main airport near Vieux Fort at the other end of the island. The Vieux Fort anchorage has a poor reputation for security and is an upwind slog once you round the bottom of the island, so we check options for getting Dave to the airport from Rodney Bay. Taxi fare is about $80 US. The bus to Castries is $2.50 EC (less than a dollar US) and the bus from there to the airport is about another $5.00 EC. This is a no-brainer. We get up early and catch the bus with Dave. This is his first real experience on a Caribbean bus. We have taken the bus to Castries and from there to Soufriere, so we know that there is no central bus terminal – each bus route has its own little terminal (sometimes just a side street). We ask directions and start our trek which eventually takes us to the other side of town. We find the buses to Vieux Fort, verify that it will stop at the airport, and put Dave aboard. He will be on his own for the rest of the trip. Now we know how parents feel the first time they put their kids on the school bus. We restrain ourselves from pinning a note on his shirt telling where he needs to go. The bus pulls out, we wave, Dave is gone. For the first time in about five weeks Jackie and I are alone on the boat. This entry was posted on May 31, 2014 at 4:09 pm and is filed under Uncategorized. You can follow any responses to this entry through the RSS 2.0 feed. You can leave a response, or trackback from your own site. The next two legs of daves adventure were uneventful. jetblue got him to boston in good condition. reading this blog entry reminds me how lucky we are to have such a great family. safe & sound.